19BOX(JUKEBOX) RECORDINGS has closed a deal with JAFROSAX. JAFROSAX is the project of KAZUKI KA-TSUTA from the famous Japanese jazz-fusion band DIMENSION. JAFROSAX mixes KATSUTA’s saxophone playing with great vocalists layered to the sounds of house, drum'n'bass, chillout and broken beats. YUKIHIRO FUKUTOMI, JAZZTRONIK, MAKOTO, DJ MITSU THE BEATS and VIKTER DUPLAIX are amongst some of the wealth of talent that has been assembled together on this project. 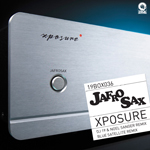 19BOX RECORDINGS licensed and released JAFROSAX’s “Saxtatic” – which was produced by DJ 19 & THOMAS PENTON in 2006. "Saxtatic" received positive reactions from DJ’s like MOUSSA CLARKE, ANTHONY PAPPA and many more. 2010 sees JAFROSAX move from the KONAMI label to 19BOX RECORDINGS. “Xposure” was produced by DJ 19 & NOEL SANGER, who delivered a remix on “Saxtatic” too. As a result they have expanded and remixed the original by and added new acidic house flavours. Rising stars BLUE SATELLITE delivered a fantastic reinterpretation in the indie-disco realm. 19BOX RECORDINGS has closed a deal with JAFROSAX. JAFROSAX is the project of KAZUKI KATSUTA from the famous Japanese jazz-fusion band DIMENSION. JAFROSAX mixes KATSUTA’s saxophone playing with great vocalists layered to the sounds of house, drum'n'bass, chillout and broken beats. 2010 sees JAFROSAX move from the KONAMI label to 19BOX RECORDINGS. “Xposure” was produced by DJ 19 & NOEL SANGER, who delivered a remix on “SAXTATIC” too. As a result they have expanded and remixed the original by and added new acidic house flavours. Rising stars BLUE SATELLITE delivered a fantastic reinterpretation in the indie-disco realm. VALID EVIDENCE is Japanese Balearic outfit formed by DJ 19 & YU-TA. This is the second installment of a remix collection, which was originally taken from their debut album “This Is A Journey Into Sound”. LERON & YVES EAUX from Holland have prepaired 2 mixes of "Mother Earth" with help of new act ARNOLD from Mumbai, India. The original has a CHICANE-esque sound, but they have added techy element to the track. "Function Junction" is a sax driven and JAYDEE-esque dance tune that features as the highlight of the album. DJ 19 has expanded and retouched it for the dance floor. VALID EVIDENCE is Japanese Balearic outfit formed by DJ 19 & YU-TA. This is the second installment of a remix collection, which was originally taken from their debut album “This Is A Journey Into Sound”. LERON & YVES EAUX from Holland have prepaired 2 mixes of "Mother Earth" with help of new act ARNOLD from Mumbai, India. The original has a CHICANE-esque sound, but they have added techy element to the track. LeRon & Yves Eaux have had many productions on different labels such as LITTLE MOUNTAIN RECORDINGS, VAPOUR, SPROUT, RESTART, NOIR MUSIC, BABYLON, TRIBAL VISION, PROTON and BAROQUE. They’ve also remixed for SANDER KLEINENBERG, SIMON & SHAKER, RENE AMESZ and DEEP FOREST. "Function Junction" is a sax driven and JAYDEE-esque dance tune that features as the highlight of the album. DJ 19 has expanded and retouched it for the dance floor.